BONUS: The first Adventure of Maggie and Arnold! 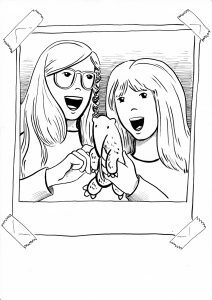 Starting July 2017, we will post a monthly episode of our webcomic Maggie McFearsome and the Giant Anteater. Imaginative yet buffeted by life, Maggie McFearsome is a talented illustrator of moderate financial success. Dumped by a live-in boyfriend who suddenly moves out, Maggie struggles to get a grip on life again. Here she finds support with her friends as well as in Arnold, a mysterious Giant Anteater with special abilities who moves in with Maggie as a flat-mate. After some misunderstandings, a great many obstacles and a surreal concert of awesomely mind-bending proportions, Maggie and Arnold become a couple. Eyes a-twinkle, the fantasto-romantic comedy fuses reality and fiction by interweaving life in San Francisco in the early 1990s with a parallel universe of mythological phantasia. Curious about Maggie and Arnold? Join them on facebook , Instagram or follow our blog on www.karikaturmuseum.at/de/news. Weiter Nächster Beitrag: BONUS: The first Adventure of Maggie and Arnold!